The Greenway Conservancy invites visitors to experience an exciting season of hundreds of music, festivals, markets, play, and fitness events on The Greenway in 2019! 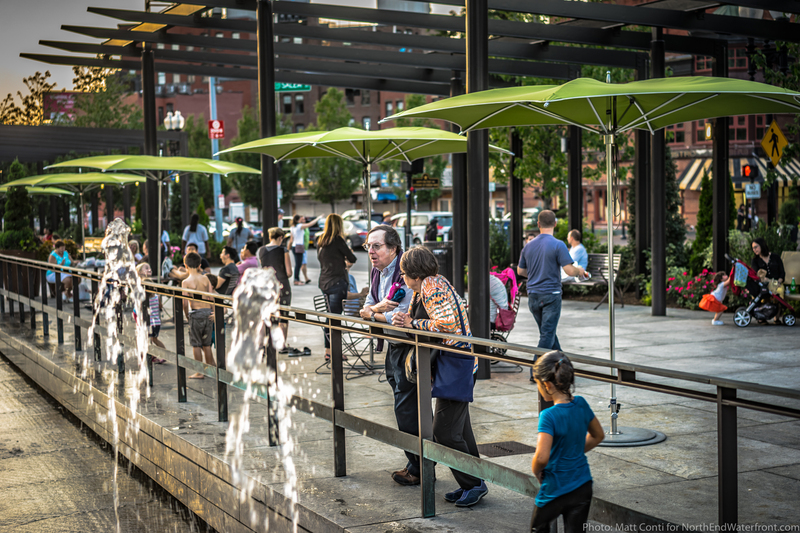 The Rose Kennedy Greenway Conservancy announced the 2019 programmatic lineup on The Greenway, a season brimming with possibilities including new food trucks, fitness partners, events, and more! Old friends and new visitors to The Greenway will experience a free and open public park, where over 450 FREE events will create opportunities to gather, play, unwind, and explore around every corner. This season will include a unique free musical performance experience from Celebrity Series, 100+ free fitness classes, and the return of festivals, markets, and play. Discover flavors from around the world seven days a week with 36 food trucks and carts in the 2019 season of Greenway Mobile Eats. The news season of vending will begin on April 1 and offer a variety of affordable, unique cuisines across seven different locations along the park. We are excited to announce seven new vendors for 2019 including Boston SnoMobile, Caffé Pellicano, Daddy’s Bonetown Burgers, Hometown Poké, Melt, Say Pao de Queijo, and The Whoopie Wagon. The Conservancy is thrilled to welcome back some of our favorite season-long partners, bringing enriching experiences to the our world-class park! Coolidge on The Greenway will return for the fifth year with movie screenings on The Greenway on June 18, July 16, and August 13. Boston Calling Block Parties are returning for their sixth season of live music, beer, and wine to Dewey Square Thursdays and select Tuesday evenings from mid-May through August. Discover unique local artisan crafts at the Greenway Open Market from May to October every Saturday plus the first and third Sundays of the month. Boston Public Market at Dewey Square on The Greenway will provide fresh and local wares every Tuesday and Thursday from mid-May until Thanksgiving. The North End Music & Performing Arts Center will bring Jazz in the Park: NEMPAC Summer Concert Series to The Greenway weekly on Tuesdays in July. The Asian Community Development Corporation, for the 14th year, will bring Chinese language kung fu films and movies about the Asian/American experiences to the park for Films at the Gate on August 23-25. Covering a range of workouts and abilities, the Greenway Fitness Program will offer over 100 FREE fitness classes running from June through September as part of the Conservancy’s fourth year of partnership with Blue Cross Blue Shield of Massachusetts on Greenway Fitness. A full schedule of the 100+ free classes will be released in late May! The Conservancy is delighted to announce a 2019 partnership with Celebrity Series of Boston’s Concert for One: 1 Musician. 1 Listener. 1 Minute of Live Music. Taking place in September, this public art project is part concert series-part social experiment that will produce thrilling, intimate free concerts on The Greenway joining one listener with one local musician for 60 seconds. A series of major festivals will take place on The Greenway in 2019, all free and open to the public. The Boston Pops Fireworks Spectacular will be returning to The Greenway this July 4 with Bloomberg for a live simulcast of this classic Boston tradition and sensational celebration. Chinatown Main Street will return with the Chinatown Main Street Festival in early July and the Lantern Festival in early September. The Caribbean One World Expo will be July 13, and the FIGMENT Boston participatory art festival will be July 27 and 28. The Chinese Consolidated Benevolent Association of New England will bring back August Moon Festival on August 11. Boston GreenFest will come to The Greenway for the first time in 2019 on August 16, 17, and 18. The Massachusetts Military Heroes Fund will return to The Greenway on September 11 for the 9/11 Service Project to Support Our Troops & Families, day to support active duty service members and veterans. September 15 will be Sustainable Business Network’s Boston Local Food Festival. The Conservancy is excited to announce this year’s play programming, with generous support from Yasso Frozen Greek Yogurt and its Game On! Foundation. Youth play programming on The Greenway includes weekly sessions in Chinatown on Thursday evenings from May through September and a SaturPLAY series in partnership with the Asian Community Development Corporation’s A-VOYCE program from April to October. As in years past, the Conservancy will continue to work with the Boys & Girls Clubs of Boston and other youth organizations, hosting 14 Youth Adventure Days on The Greenway. Two ticketed fundraising events will take place on The Greenway in June. At our Gala on The Greenway on June 6, we will honor Governor Charlie Baker for his leadership on behalf of the Greenway Conservancy since its inception. As a private citizen, Baker served on our founding Board of Directors and, as governor, his leadership was instrumental in creating the landmark 2017 multi-party funding agreement for The Greenway. Our event Co-Chairs are Alli & Bill Achtmeyer and Bob & Laura Reynolds; sponsorships are currently available. On the following night, June 7, guests will enjoy live music, performances, food, and beverages while supporting the Conservancy at our signature young professionals event, Glow in the Park. The Conservancy’s full program calendar compliments all the The Greenway has to discover, from local drinkeries, contemporary public art, seven unique water features, and more! Organic lawns and gardens invite visitors to unwind, the Greenway Carousel at The Tiffany & Co. Foundation Grove will soon be spinning daily with a host of native New England creatures, and our free Wi-Fi network continues to stretch the entire 1.5 mile length of The Greenway. Many events are still completing permitting and are subject to weather and schedule changes. Our calendar is available online and updates are available by following The Greenway on Twitter, Facebook, Instagram, and signing up for our weekly e-newsletter. Previous articleBoston’s Best Spellers Celebrated at 12th Annual Citywide Spelling Bee; North Enders Take 1st and 3rd Place!